Cuckoo – known as koel, kuyil or kokila in India – in Hindu tradition is a symbol of fertility. The bird is the Vahana or vehicle of Jayakara, a companion of Kamadev, the god of love in Hinduism. Sometimes Jayakara is depicted as riding a chariot drawn by Cuckoos. A popular legend of Goddess Sati is also associated with the Cuckoo bird. There is a legend that Goddess Sati spent 1000 celestial years as a cuckoo before she got back her shape and merged with Shiva. This happened after the incident mentioned in the Puranas in which Sati immolated herself. It is said that she took the cuckoo form as a punishment for not listening to Shiva’s warning. Shiva had warned that She will be insulted at the yajna of Daksha Prajapati. She went to the yajna in spite of the warning and had to self immolate Herself after hearing insults hurled on Shiva by Daksha. There is also a popular vrat known as Kokila Vrat in North India in Ashada month (June – July). It is performed by woman for the welfare of her family. 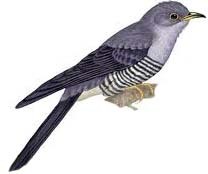 Cuckoo is also associated with Ugadi, the New Year festival in Karnataka and Andhra Pradesh. The song of cuckoo symbolically represents hope and a good harvest.